WINNIPEG, CANADA – Travel Professionals International (TPI), a top 30 Virtuoso member and Canada’s leading network of independent travel advisors and agencies, celebrated the success of its top advisors by hosting them and their guests on the annual TPI Chairman’s Circle trip – this year aboard an AmaWaterways river cruise – alongside Morris Chia, TPI President & CEO. Advisors traveled on board the AmaDara sailing on the Mekong River from Vietnam to Cambodia. “AmaWaterways is thrilled to once again to have hosted the TPI team of top travel advisors for this very prestigious event. Our strong relationship with TPI continues to grow each year and this year, we showcased Southeast Asia and our beautiful ship, AmaDara, to this exceptional group of TPI travel advisors,” said Kristin Karst, AmaWaterways Executive Vice President and Co-Owner. The AmaDara started its voyage in My Tho Port, outside of Ho Chi Minh City, with stops in Phnom Phen, the capital of Cambodia, and concluded in Prek Kdam, Cambodia. In addition to enjoying the voyage itself, TPI advisors spent time relaxing and networking with their peers and with TPI executives including Chia; Tim Morgan, Vice President; Rhonda LaFosse, Director of Sales; and Laura Kwiatkowski, Director of Marketing. 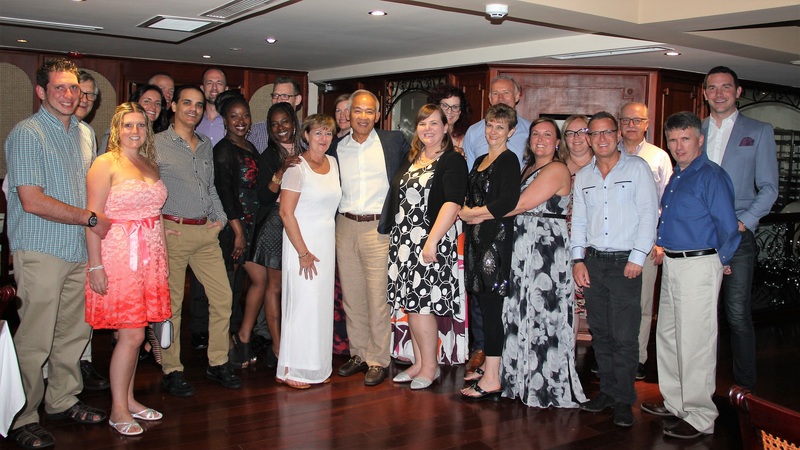 “It is truly my honour to have hosted our top achievers for this once-in-a-lifetime voyage as we recognize their commitment to success,” said Morris Chia, TPI President & CEO. The TPI Chairman’s Circle trip is part of TPI’s larger Velocity travel advisor recognition program and is dedicated to recognizing and celebrating the successes of TPI’s highest-producing travel advisors. Since its founding in 1994, Travel Professionals International (TPI) has been the premier provider of outsourced travel solutions to independent travel advisors and agencies. Backed by a head office support team of fifty highly skilled travel professionals, innovative technological solutions, and excellent supplier relationships, hundreds of TPI advisors across Canada are available to provide full-service travel solutions to leisure and corporate travelers.